Healthy teeth and gums have a direct impact on good oral health; this requires more than just daily brushing and regular dental checkups because it’s only one small part of your overall physical and mental well-being. Our professional staff understands, diet, pregnancy, chemotherapy, and physical illnesses can affect your health and we are committed to working with your health. What age do you start seeing patients? We see patients starting at age of 6 months old. What types of insurances are accepted? We accept Medicaid (21 & under), CHIP (18 & under), Most PPO Insurance. We accept Cash, Most Credit Cards, CareCredit. Your appointment is set aside for you. Broken appointments represent a cost to us, to you, and to other patients who could have been seen in the time reserved for you. Please take the time to call us if you need to reschedule your appointment. Plaque formation and growth is continuous and can only be controlled by regular brushing, flossing, and the use of other dental aids. Plaque is a film of food debris, bacteria, and saliva that sticks to the teeth and gums. The bacteria in plaque convert certain food particles into acids that cause tooth decay. Also, if plaque is not removed, it turns into calculus (tartar). If plaque and calculus are not removed, they begin to destroy the gums and bone, causing periodontal (gum) disease. Brush your teeth at least twice a day (especially before going to bed at night) with an ADA approved soft bristle brush and toothpaste. Flossing — Daily flossing is the best way to clean between the teeth and under the gum line. Flossing not only helps clean these spaces, it disrupts plaque colonies from building up, preventing damage to the gums, teeth, and bone. Bad breath (halitosis) can be an unpleasant and embarrassing condition. Many of us may not realize that we have bad breath, but everyone has it from time to time, especially in the morning. There are various reasons one may have bad breath, but in healthy people, the major reason is due to microbial deposits on the tongue, especially the back of the tongue. Some studies have shown that simply brushing the tongue reduced bad breath by as much as 70 percent. In most cases, your dentist can treat the cause of bad breath. If it is determined that your mouth is healthy, but bad breath is persistent, your dentist may refer you to your physician to determine the cause of the odor and an appropriate treatment plan. According to the American Dental Association (ADA), up to 76% of dentists use silver containing mercury to fill teeth. The ADA also states that silver fillings are safe and that studies have failed to find any link between silver containing mercury and any medical disorder. The general consensus is that amalgam (silver) fillings are safe. Over the years there has been some concern as to the safety of amalgam (silver) fillings. An amalgam is a blend of copper, silver, tin and zinc, bound by elemental mercury. Dentists have used this blended metal to fill teeth for more than 100 years. The controversy is due to claims that the exposure to the vapor and minute particles from the mercury can cause a variety of health problems. Regular dental exams and cleaning visits are essential in preventing dental problems and maintaining the health of your teeth and gums. You should have your teeth checked and cleaned at least twice a year, though your dentist or dental hygienist may recommend more frequent visits. At these visits, your teeth are cleaned and checked for cavities. Red and puffy gums — Gums should never be red or swollen. Bleeding gums — Gums should never bleed, even when you brush vigorously or use dental floss. Persistent bad breath — Caused by bacteria in the mouth. New spacing between teeth — Caused by bone loss. Loose teeth — Also caused by bone loss or weakened periodontal fibers (fibers that support the tooth to the bone). Pus around the teeth and gums — Sign that there is an infection present. Receding gums — Loss of gum around a tooth. Tenderness or Discomfort — Plaque, calculus, and bacteria irritate the gums and teeth. As we age, the outer layer of tooth enamel wears away, eventually revealing a darker or yellow shade. Smoking, drinking coffee, tea, and wine may also contribute to tooth discoloration, making our teeth yellow and dull. Sometimes, teeth can become discolored from taking certain medications as a child, such as tetracycline. Since teeth whitening has now become the number one aesthetic concern of many patients, there are many products and methods available to achieve a brighter smile. It’s important to have your teeth evaluated by your dentist to determine if you’re a good candidate for bleaching. Occasionally, tetracycline and fluorosis stains are difficult to bleach and your dentist may offer other options, such as veneers or crowns to cover up such stains. Since teeth whitening only works on natural tooth enamel, it is also important to evaluate replacement of any old fillings, crowns, etc. before bleaching begins. Family Dental Practice proudly serving patients in Humble, Atascocita, Cleveland, Conroe, Huntsville, Livingston, Magnolia, North Houston, Oak Ridge North, Porter, Shenandoah, Shepherd, Spring, The Woodlands, Tomball & Willis Texas. 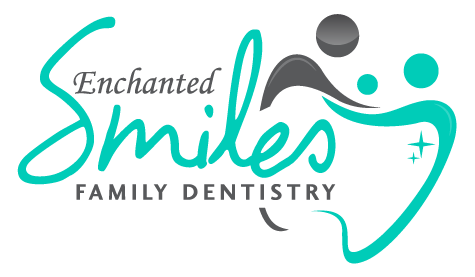 © 2019 Enchanted Smiles Family Dentistry · All rights reserved.